"Happy Pongal to all my friends here"
Pongal used to be my favorite festival and I enjoy preparing pongal in clay pot with lots and lots of fruits and sugar cane especially on both sides of the pot. Even now I can visualise those days when I was in school, my patti make all the arrangements to cook pongal. Me and my cousins stand next to my patti and enjoy those rituals. The main purpose of standing is the sugar cane which we were all crazy about... Since we lived in an Agraharam, very near to temple, Makara Deepam festival is celebrated every year in a very grand manner and it comes during this Pongal days and my uncle is a member in that festival committee, so most of the members will come to our house for lunch and dinner, nearly for a week, till the festival gets over on 16th January every year. Our house will be full of people for more than 10 days. When I called yesterday to greet all my relatives, I talked to more than 10 people over phone. I miss them all so much here. 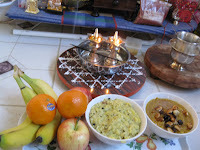 For the past 6 years, I don't do much pooja or something on pongal. 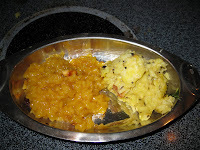 I just make chakkara Pongal (sweet pongal) and offer it to god and serve it to my husband and kids. Because 6years back, on the same day, my mom died and after that I stopped doing all these rituals. But this year, my patti(mom's mom) asked me to do pooja and the rituals on Kanu like preparing variety rice etc., so that it might help my girls to learn all those rituals. 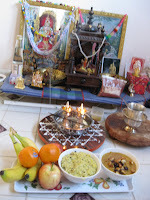 So this year I made both venpongal and chakkara pongal and did pooja today morning. Felt like recovering from something :).... Alright, coming back to the business, here is the recipe for Chakkara Pongal (sweet Pongal)I made today. This is the step I followed to make chakkara pongal. First cook rice and dhall with 3cups of water. Cook it upto 4 or 5 whistles. When the pressure is released, take it out and mash it. In the mean time, take a heavy bottomed pan, dissolve jaggery with a cup or two of water, add pacha karpooram, cardamom and bring it to boil. Now add the mashed rice to jaggery and mix it well. Add water to adjust the consistency. In a small pan, pre heat ghee, fry cashews and raisins to golden brown and pour it on top of chakkara pongal. You can get the recipe for venpongal here. I am sending this recipe to Priti's Makara Sankranti Festival event. Would have loved to be celebrating Pongal in your family's house. Sounds fantastic!!! I want to make sweet pongal.. but what is Pacha karpooram? Thanks. Nice to read your nostolgic moments.. even too missed all these things. sorry to know about your mother. same coincidencemy father died on thruvathirai.. so many years we didnt prepare kali.. now only istart preparing kali.. Time heals everything.. 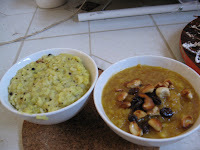 The pongal at your home looks great and feels like I should try sooner, as we have never used thoor dal for Pongal. My mom uses Pasi Paruppu for pongal and she cooks both rice and paruppu separately and mixes the jaggery after they are done. My MIL's method is just Raw rice pressure-cooked and then added with jaggery and other stuff. i have added your blog in my list. If you like my blog please link me back! Thanks for wishes guys..Thanks Dhanasakthi for pointing out my mistake. I also use moong dhall. It was my mistake while typing. pachai karpooram enga kedaikum vidhya? I have the same question as remya, Vidhya. Today I went to the Indian store and asked the store clerk for it after scouring the store...they found camphor for puja.. but said they never hear of the cooking variety. How's the recipe without it? thanks for add my blog! Wonderful pictures... Feels homely & traditional. Nice that you are back on track to make our kids learn...Sorry to hear about ur mom. As Jaishree said, time heals everything..Take care..
Something very similar with me too dear...I know exactly how it feels but with time we all learn and move on..which you are doing too and it's great..Pooja and pongal both looking wonderful..thanks for the lovely entry. Im glad to hear that you started your Pongal traditions, Im so sorry to hear abt your mother...its so difficult to deal with such a big loss...but you have pulled through..hats off..